Does the glass require a "special" fireplace? No. Our product is designed for use in a vented, vent less or direct vent fireplace. Ask for details on this is done. Can I convert my wood-burning fireplace to gas? Yes. We have hundreds customers who have called a contractor or plumber and have plumbed natural gas and even propane to their fireplace. This is not an uncommon home improvement and the cost is typically very reasonable. 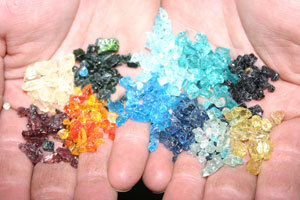 The amount of glass for each fireplace varies depending on size and fill depth. Most average fireplaces are 36" wide at the front (side to side) and 18" deep (front to back) with a 3" fill level will take about 100 pounds of glass. 1/2 if not most of this should be filled with either lava rock or pea gravel to minimize on the cost. Does the Aquatic Glassel tempered glass product produce heat? Yes. The glass itself radiates heat and provides a constant flow of heat to warm your home. This product produces more heat than gas logs and is far more efficient primarily because there is nothing blocking the radiant heat produced by the flame and hot glass. What is the difference between your glass and other glass? The most obvious difference is our glass is specially processed tempered glass. 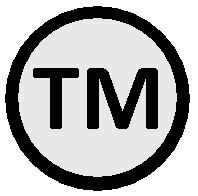 (Patent Pending) Beyond that the difference between ‘our’ glass and ‘other’ tempered glass is the processing of our patent. 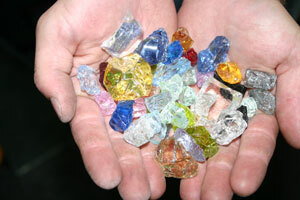 We now manufacture a large amount or our glass, which is only available by us, and a few select dealers. Warning! 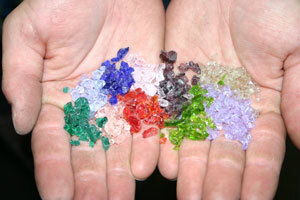 There have been several companies selling recycled glass (broken bottles and jars ground up) for fireplaces and fire pits, as this glass will POP out of the fire. 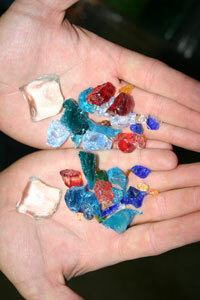 Besides if you want your glass to look like trash glass in your fireplace then try it! 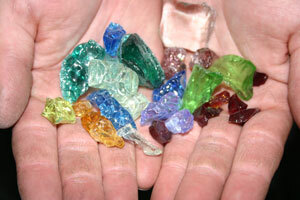 We have posted pictures of our glass in our hands so that you should actually see what you are getting. Be sure you see what you are getting before you get it. The pictures below are of our toppers and our staff was holding them to show you the texture and size in relation to the your hand. 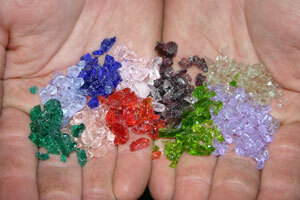 Our toppers are a unique formula of glass and made for this purpose to be used in fireplaces and fire pits. We have been compelled to show you the glass in relation the texture and size so you know what you are getting for your fireplace or fire pit. 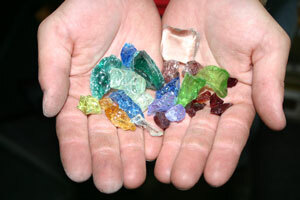 If you planned on purchasing from a glass recycler (crushed bottles and jars) please ask to see what you are getting. Our glass is not recycled as it is made for this use and is not dangerous in fire, as jars and bottles do pop in the fire, try it and you will see what we mean. We take pride in the selection we offer you as a customer, so remember you do get what you pay for. If you didn't plan on trash glass in your fireplace, then don't buy trash glass. Aquatic Glassel is the only real product in the marketplace that: burns clean, is odorless and pollution free; creates instant romance and ambiance, has interchangeable colors, never creates a mess, is not sharp, is environmentally safe, affordable, unique, easy to assemble and install, and is fabricated from tempered and processed glass that will not change colors nor degrade, and lasts a lifetime. How is that for a start? Can I use ordinary glass in my fireplace? No. 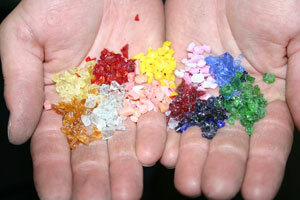 Ordinary glass or even typical tempered glass will look like trash glass in your fireplace and can pop or even shoot out a shard or two into your room. Laminated windshield glass will blacken and melt. Be careful not to place products in your fireplace that you are unfamiliar with. For example, tempered windshield glass incorporates a plastic film that will generate a most annoying smoke & odor and by the chemical make up this can cause a poisonous gas! 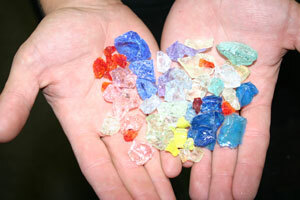 Using recycled glass looks like trash and is dangerous because it can pop out and hurt someone or damage the surroundings. Can I use my existing gas pipe or do I need to buy new pipe? If your gas pipe is not rusted and displays an adequate flame in your fireplace when you remove all the logs you may use your existing burner pipe. For those who wish to create a custom or brilliant flame we suggest you consider a double burner or even one of our manifolds. No. Aquatic Glassel products are manufactured from tempered glass that is immune from any degradation due to thermochromism (effect on color due to heat) and phototropism (effect on color due to light) and of course our very own processing. Can the glass get dirty? Yes. Like any household furnishing the glass can get dirty and dusty. If there is an obvious build up of dirt one can scoop out the glass and wash it with dish detergent followed by a thorough rinse. Another common option is mixing the glass with one’s hand or a flat object to eliminate surface dust. No. The special processing (patent pending process) allows the glass to be handled without worry (watch out for look-a-likes, they do and will cut!). There is a special process involved thereafter to assure the glass is safe and relatively free of all sharp edges. 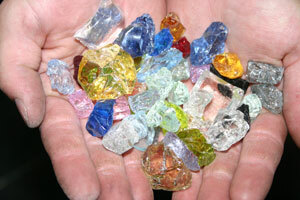 One can literally pick up and squeeze the glass pieces without risk of cuts or glass slivers. 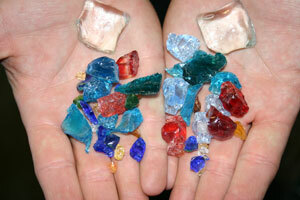 However, like all glass products, one can degrade and sharpen this product by dropping or misusing the glass. Please use common sense. Are there any odors from the glass? No. 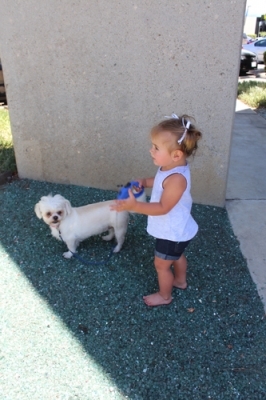 The glass is clean and does not degrade nor generate any malodorous nor odiferous fumes from Aquatic Glassel products. Will this product discolor or leave soot on my fireplace mantle? No. Not when installed and used properly. Over 400! We have the product in clear, grays, bronzes, blacks, greens, blues, sterling coated, titanium coated, chromium coated, gold coated. 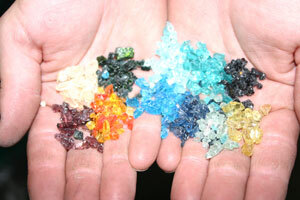 Many of our customers like to mix the colors to create different combinations. 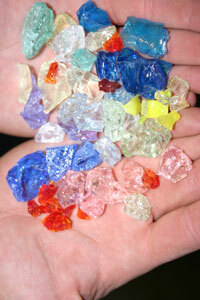 We are constantly developing new colors and products to add to our product offering. We currently have over 500 products available and by the end of the summer we should be up to and over 550 products. Can I add or change colors? Yes. 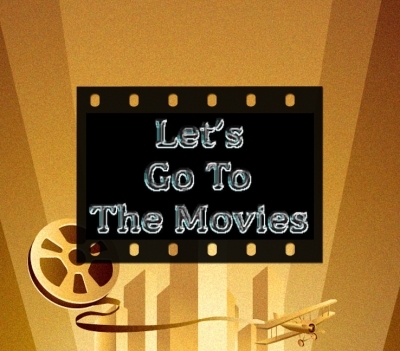 You may add or mix colors at anytime to create special effects. We have several customers that have purchased multiple colors to change the look of their fireplace at various times of the year. Is the glass chemically treated? No. There is neither chemical treatment nor surface coating on this product nor are there any chemical by products generated from using Aquatic Glassel products. I rent my home. Can I remove the glass? Yes. We have several customers who rent but desire the ambiance and warmth of a fireplace. Aquatic Glassel can be easily removed and placed in a new fireplace. 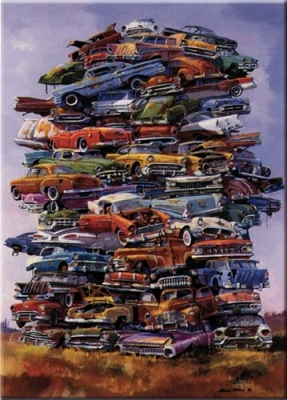 You may transport the product to and from multiple fireplaces and households. As a homeowner will this product increase the value of my home? Yes. Each and every homeowner who has purchased this product considers this a home improvement. Our product is marketed in model homes as an upgrade to gas logs. Several real estate agents offer our product as value added home upgrades. Does your product produce any bi-products? No. None. This product does not breakdown or add any bi-products to the products of combustion created by burning natural gas or propane. Do I need to leave the flue open when in use? Yes. We suggest at anytime you burn your fireplace that you make sure adequate ventilation is provided. Although some persons may argue opening the chimney flue is not necessary, we believe you should always leave your flue open when your fireplace is in use. Our product can be used in a vent less system provided that you do not change the sensors, settings, or burners, as these are specific items by the manufacturer and cannot be changed. We recommend getting a vent less where the sensors are not in the logs. Because when you take the logs out you will be removing the sensors and you will need those. We have not formally tested any vent less fireplaces but we plan on U.L., CSA, Radco and AGA testing in the future. Does this product only work in fireplaces? Will the Aquatic Glassel product work with propane? Yes. However, when using propane in your fireplace it is very important to be sure the bottom of the fireplace is sealed completely. Propane gas has a tendency to sink whereas natural gas tends to rise. Special provisions must be taken before propane can be used. Please consult your local authorized dealer for application assistance. What if I don’t know my fireplace dimensions, can I still order your product? Yes. The amount of glass for each fireplace varies depending on size and fill depth. Most average fireplaces are 36" wide at the front (side to side) and 18" deep (front to back) with a 3" fill level will take about 100 pounds. On larger fireplaces we recommend a filler base such as crushed lava rock or pea gravel to cut the cost. Can I use your glass product in an outdoor fire pit? Yes, absolutely. This product is used in several outdoor fire pit applications and is easily cleaned simply with water. The evening brilliance is spectacular. The base of this should be filled with either lava rock or pea gravel to minimize on the cost. Will the glass around the burner pipe get hot? Yes. The glass around the burner pipe is more warm than hot as one can usually place one’s hand directly on the glass next to the flame, but not within. Like all products that conduct heat the longer the fireplace is on the warmer the surrounding glass will get. One remarkable product attribute is after one turns off the gas the glass cools rapidly on top to touch yet remains warm below radiating heat for hours. Will the burner pipe be visible? No. We cover the entire burner pipe. However, sometimes the gas inlet is exposed due to its location in the fireplace. Several of our fireplace clients have added glass to cover everything within their fireplace. What if I order too much glass, can I return it? Yes. One may return any excess glass to the distributor or directly to the factory, after receiving a return authorization, for immediate credit. 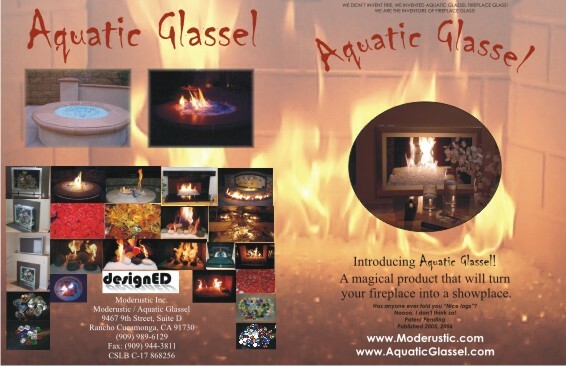 Can I use Aquatic Glassel glass products with gas logs? No. However, we suggest you consider the décor of your home when making this decision. Gas logs and Aquatic Glassel do not generally complement each other and we have had seen soot on the glass as logs tend to create carbon monoxide. Can I take your glass product with me if I move? Yes. We have several customers who rent or even purchase this as a tool to sell their home. One of the product benefits is that one can remove the entire product within 30 minutes safely without risk of spreading dirt and filth in their home. How do I store your glass when I transport it? Simple. One may use simple sandbags or any box that accommodates the size and weight of the glass. Will the glass break any further when in use? No. 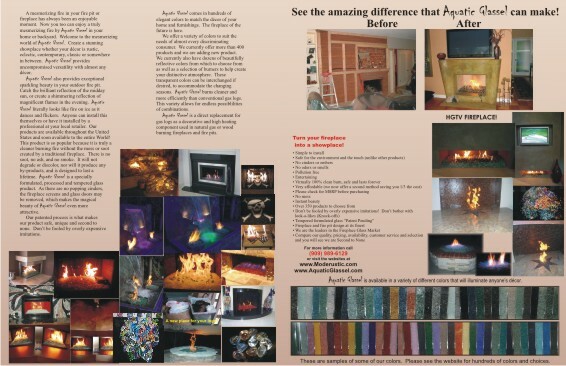 The Aquatic Glassel product will last virtually forever when left within the fireplace. 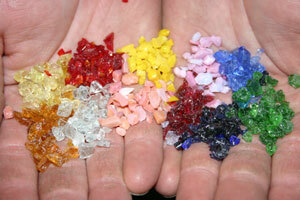 Like all glass products there is a risk of breaking pieces due to mishandling or during transport. When one re-installing the product after moving there may be some glass sediment or broken pieces at the bottom of your container.